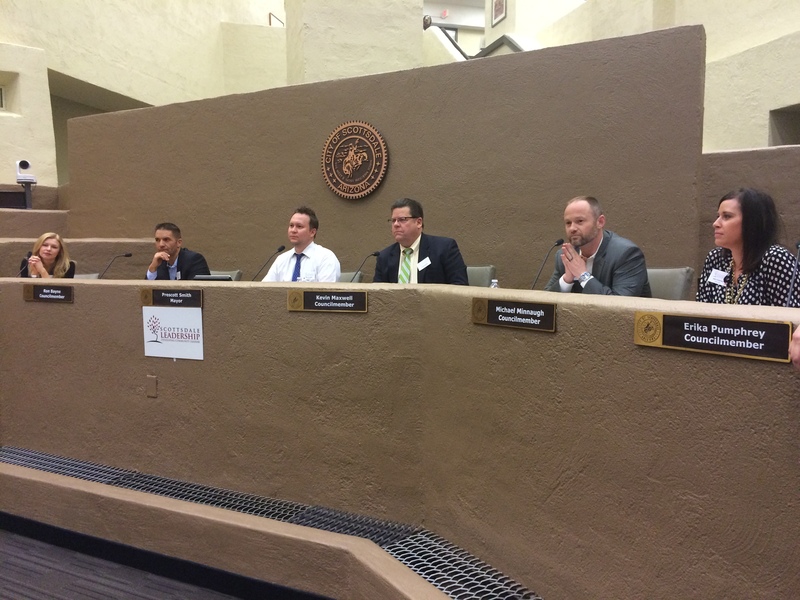 Our City Government day taught us there’s a lot to celebrate about living in Scottsdale. Held in the impressive Kiva, we gained a lot of insights into running the city, and even experienced a mock city council meeting. Our day kicked into high gear with the introduction of new Scottsdale Leadership Executive Director Margaret Leichtfuss, and what’s not to appreciate about Margaret besides the extensive experience and background she brings to her role? Anyone who loves shoes and red wine gets an AAA rating in my book! We were lucky enough to have time with Mayor Jim Lane who talked about the intricate balance between residents, businesses, and tourism that make his job both challenging and rewarding. Interestingly, while our resident Scottsdale population is about 225,000, during a season the number can swell to 3 or 4 times that and we host about 9 million visitors in a year. Big numbers! Clearly there are many who wish to experience the quality of life that our residents give a 98% favorable rating to. Our city covers 183 square miles; 31 miles long and 11 miles wide, ranging in elevation from 1151 ft to over 4800ft. This is notable for the impact it has on water delivery; residents in the higher elevations must have water pumped uphill to them as the canals are at lower elevation and use gravity to deliver water to the valley. We have the 95th largest city in the US with a $1.2B budget. Based on what we learned in the break out sessions on budget and services, we get a great deal with over 50% of our property taxes going to the school district, and services that keep our neighborhoods clean, provide our visitors with a positive experience, and providing our residents with the facts and information they need to live, work and obtain support in the community. And what if we want to become an elected official? I found it interesting that it takes raising an average of $29K (average raised for the last election was $58K), and if you plan to run in a presidential/mayoral election year the voter participation will be significantly higher (84%) vs a non presidential/mayoral election year (57%). For those with interest, we learned about various boards and commissions that work with the city council and how to take the first steps to becoming involved. Our afternoon was spent on prepping for and participating in a mock city council meeting. As a member of the team that drafted the City’s General Plan 2035, I was interested to learn of the work that went into preparing the draft, the community involvement, the level of commitment and effort required to bring it to the council. As an observer of the council meeting it was also interesting to hear the varying opinions and perspectives, not only of the council members but also the community residents who attended and shard their feelings on the plan. For me the plan shows the intent of the city to continue on the current path of controlled growth, focus on services, and positive environment for residents, businesses and visitors alike.